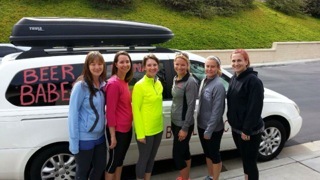 Two weekends ago, I joined a group of 11 other women and we left in two vans for a 200 mile running relay from Huntington Beach, California to San Diego, California! The race took place all day and all night with some one always running. When I explain this relay to non-runners, they simply stare at me…wondering if I, a 39 year old mother of 4 children ages 6 and under, have lost my marbles. Seriously, who in their right mind would leave their children for two days, pack into a van of 5 other women I did not know very well, and run all day and night? 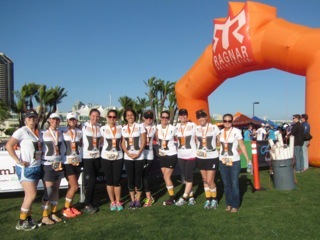 Yeah, meet the Beer Babes, that is our Ragnar Team. We drove the Beerbulance. We drank beer at the end. And we got some bling….it’s always about the bling. As a non-runner, I can see how this sounds like something a Fraternity would do….but I assure you, we are not a Fraternity! I WILL say it was an unforgettable weekend! I cannot believe it was 2 weeks ago already! 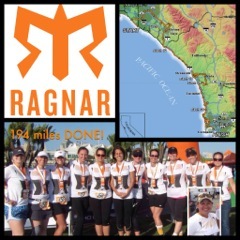 The pictures alone tell the story of how much fun we had….we as a team ran 194 miles on ZERO sleep! As moms we are used to waking in the middle of the night to feed our babies, but imagine waking in the middle of the night to run? Yeah….can’t wait for the next one! As you can see it was fun! An experience of a life time! It all started last year when I first joined Moms Run This Town. 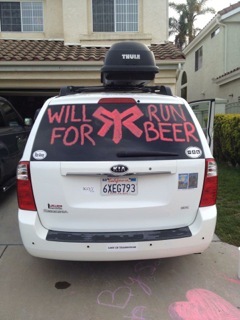 Our leader asked if anyone would be interested in running a Ragnar Relay…I agreed because it seemed fun, but I will admit, as the day approached I was scared. Especially of a run in the middle of the night!! We did not get much opportunity to train together as a team. We did a few races with a few team members and a few socials. But to get together as a full 12 member team was next to impossible with all our schedules! So we all trained on our own….hills were a MUST! Then we decided on cars. I volunteered my van. I figured it could hold up to 4 kids in carseats, it could hold up to 6 women! Haha! 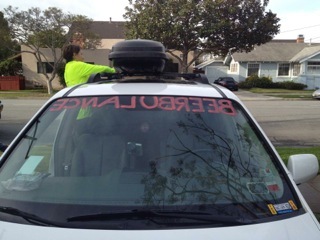 The night before, a local team member and I decorated the car…we put the finishing touches on the morning of. Then we hit the road to pick up all our team members! Yeah….we got looks. High five’s. Thumbs up….and just smiles from cars we passed on the road….but it was nothing compared to what we saw when we got to that first exchange! 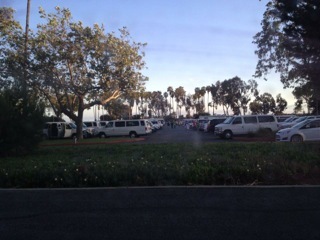 Vans everywhere!! All decorated crazy-like! What fun!